Why do I bring this up in relation to my own work, especially my newest work, “Picnic in the Rain”? Because this is completely and entirely true of how I arrive at what I call my art work. No, I don’t make readymades in the same way Duchamp did. But, yes, I do very much decide on calling things art that are no ‘made’ by me. In fact I find I’m attracted more and more every day to things that come to me wholecloth. They are complete without my interaction. So of course I muck around with them. I put my ‘stamp’ on them in some way, which lately has been an exploration of what perception really means and how our lack of personal time, of real experienced time prevents us from seeing. Nonetheless, I reach further and further into the place that Duchamp opened up for us, a place where a sense of complete genuineness arises out of less ‘trying’, less doing, rather than more. I’m convinced now that this is in part the reason why so much contemporary work feels tired to me. It is completely overworked to the point of exhaustion. The more one does to something the less it feels original. It just feels clever and frankly I’ve seen enough clever in my life that I can do without any more. 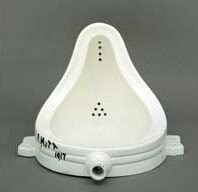 So, here’s to Duchamp and his brave leap, his philosophical discovery and maybe the road into a simpler, more open space.